Has a away player in server? Simple, type !votespc. This addon lets any player join to spectators through one of the chosen chat commands. 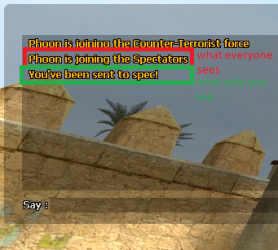 If specified the spectator will not be able to join back until the specified time has passed. This remaining time can be displayed in different areas.